Writing a letter to Santa Claus can be almost as much fun as getting a letter back from good ol’ Kris Kringle. Kids love to sit down and create a wish list and then tell Santa everything they’d like for Christmas. Writing a letter to Santa can also help your kids practice their spelling, grammar and letter writing skills. 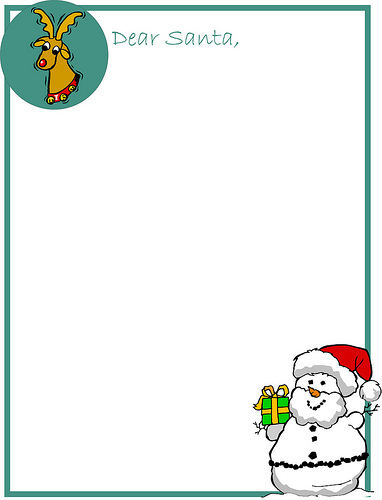 This free Letter to Santa template makes it even more fun because your kids have a cute design on which to write their letter. And it’s free! All you have to do is print it out on your own computer, give your kids a pen or pencil, and let them tell Santa Claus all about how good they’ve been this year. Simply click the image to open a pdf file that you can print out on your own printer so your kids can write their letter to Santa Claus. And don’t forget to have Santa write back! 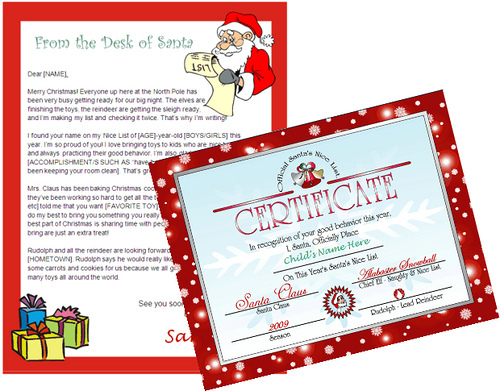 Check out our Santa letter templates to help St. Nick respond to your child’s letter. Each Microsoft Word document comes with a colorful holiday background, three variations of text that you can personalize and two Santa letter envelopes, so you can customize and re-use your Santa letter template year after year or for multiple children without ever spending more money. You can also get combo packs that come with all the features above, as well as a Nice List certificate, or get the complete Santa letter package that will give you enough variety for all the kids in your family for years to come. For tips on helping your kids write a letter to Santa Claus, see How to Write a Letter to Santa at HowToDoThings.com or How to Write a Letter to Santa Claus at Squidoo.com.